Web site design services with professional experience over 8 years. Web, do you think how long ago? And to do or have? 4 Packages of us consider what you want or not. * Service made three 3-style site as your needs. * Price does not cost more money in one statement. * Get a job pretty satisfied. * Timely Than use indeed. * With other services required. Your business to escape the rush to the Internet immediately. 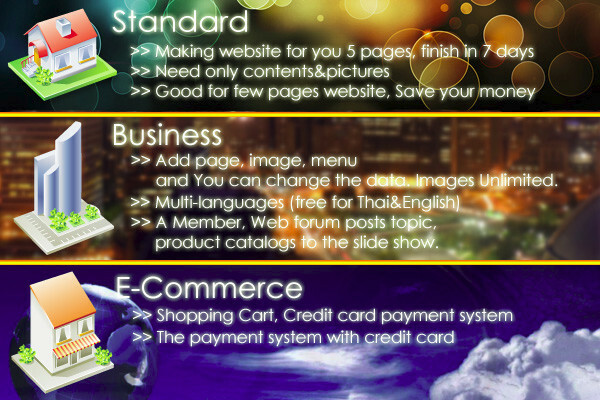 >> Making website 1 page, input pictures 10 pics. >> input pictures not over 30 pics. Note: this website haven’t backend admin system, so you cannot edit by yourself. >> input picture not over 40 pics. >> input picture not over 50 pics. >> input pictures or products not over 70 pics. 4.4 Editing information on the web. Minimum charge 500 baht depending on the job.